Item # 302746 Stash Points: 999 (?) This is the number of points you get in The Zumiez Stash for purchasing this item. Stash points are redeemable for exclusive rewards only available to Zumiez Stash members. To redeem your points check out the rewards catalog on thestash.zumiez.com. 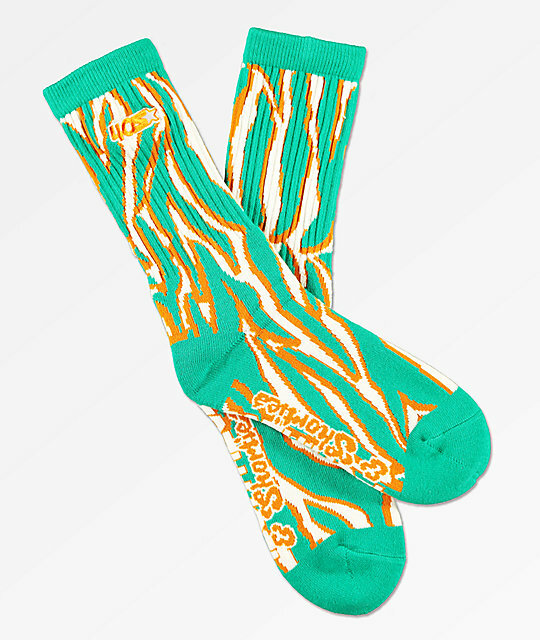 Get wild in the Tiger Stripe Teal & Orange Crew Socks from 40s & Shorties. These tube socks feature a colorful orange and teal tiger stripe pattern throughout for a bold look. Complete with 40s & Shorties logos throughout, these athletic socks are sure to provide comfort and style. Tiger Stripe Teal & Orange Crew Socks from 40s & Shorties.